Home > BURNED: Are Trees the New Coal? A new version of BURNED: Are Trees the New Coal — the hard-hitting documentary that exposes the truth about the biomass industry — has just made its debut on Link TV and is available for international free streaming! BURNED: Are Trees the New Coal? tells the little-known story of the accelerating destruction of our forests for fuel. This powerful film probes the policy loopholes, huge subsidies, and blatant greenwashing of the biomass electric power industry. Here in the US South, our forests are disturbed at a rate four times higher than South American rainforests. Dogwood Alliance has documented the increased pressure that the biomass industry has put on this heavily logged landscape. Every year, tens of thousands of acres of Southern forests are cut down, turned into wood pellets, and shipped overseas by Enviva, the world’s largest wood pellet manufacturer, to be burned for electricity. At every step of the process, the industry is devastating our forests, harming communities’ health, and imperiling our chances at solving the climate crisis. 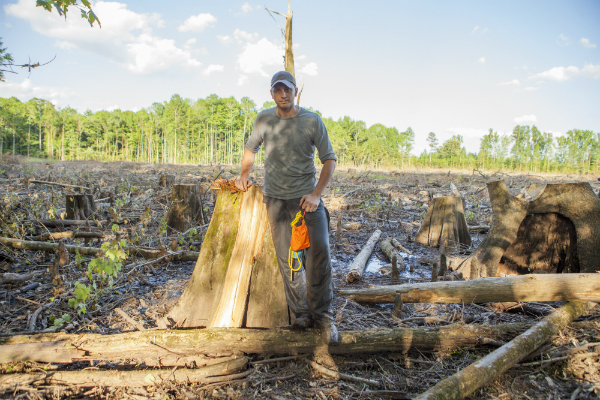 Adam Colette at the site of a devastating wetland clearcut, where Enviva was sourcing for one of their North Carolina facilities. Watch the documentary for footage of this 2015 investigation. BURNED: Are Trees the New Coal will be available for streaming for four months, through July 18th. Watch how a dedicated group of forest activists, ecologists, carbon scientists, and concerned citizens fight to establish the enormous value of our forests, protect their communities, debunk this false solution to climate change, and alter energy policy both in the US and abroad. Be sure to watch and share! Our forests are worth so more when they’re standing than when they’re burned for electricity. Sign the pledge to Stand4Forests today. This is unsustainable and polluting. Again, greed and personal gain prevails. We must think of our planet, our future, our chikdren’s and beyond.